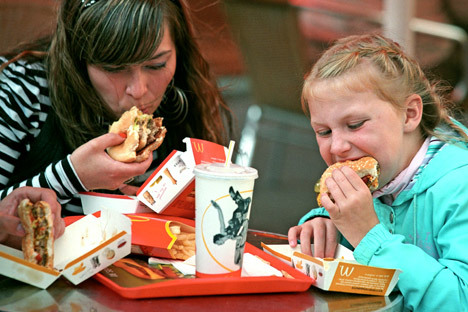 'Patriotic' alternative to McDonald's causes a stir on Russian internet. On April 9 the Kommersant newspaper reported that veteran Russian film directors Nikita Mikhalkov and Andrei Konchalovksy, who are also staunch Kremlin supporters, had asked the government for a lump sum of 900 million rubles ($16.9 million) in order to create a “patriotic” alternative to western fast food chains such as McDonald’s. Mikhalkov’s every move is already being scrutinized by the tech-savvy opposition due to his nationalist and Slavophile views, his unwavering support for Russian President Vladimir Putin and the Russian Orthodox Church and his proposal to introduce a universal copyright fee to be levied on all internet users. As if this wasn’t enough, he has now exposed himself to a further wave of verbal brutality and mockery by proposing to call the chain “Yedim Doma” (“Let’s Eat at Home”). Mikhalkov + a slightly contradictory name = virtually endless material for this edition of Viral in Russia. А могли ведь, как обычно, просто обложить сбором каждый проданный гамбургер, и ничего не просить у государства! They could have just levied some kind of tax or royalty from each hamburger sold and not ask the government for anything. Will Mikhalkov charge entrance fees? He needs to compensate the cows for copyright. He asked Putin for a billion in order to open a fridge. Кафе "Едим дома" отлично впишется в общую абсурдную картинку. Как зоомагазин "Ненавижу животных". Детям всей страной собирают по рублю на операции в инете, по ТВ, а Михалков просто просит миллиард у Путина на ресторан. Люблю Россию! People use the internet and TV to collect a few rubles for their children’s operations all over the country while Mikhalkov simply asks Putin for a billion to open a restaurant. I love Russia! For all those wondering about the fate of Mikhalkov’s loan request: It was a short but sweet “no”.